From a power standpoint, the nitro RC helicopter engine is what first made this hobby possible. Without the enormous power to weight ratio along with the very simple design that nitro engines provide, our model helicopters would have never been able to leave the ground. As you can see in the above photo, a nitro engine is surprisingly simple in design with very few parts. There are 3 parts hidden from view in this photo which are still inside the crankcase. These include the crankshaft, along with with the front and rear crankshaft bearings. 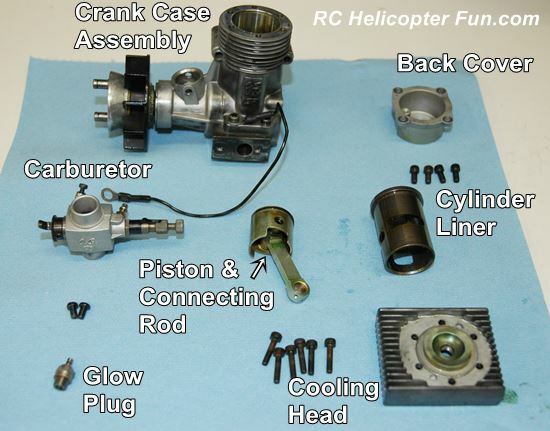 In total, there are really only nine main parts to this particular nitro heli engine; and out of those nine, only 3 moving parts (the piston, the piston connecting rod, and the crankshaft). It's this amazing simplicity and low parts count, that make these little engine so reliable and light weight. Most of the main parts are made from light weight aluminum other than the crankshaft, bearings, cylinder liner, and hex bolts/screws. The other item you will notice with nitro heli engines is they have a larger cooling head than plane specific nitro engines. This is due to the fact there is not nearly as much cool air passing over the engine in a heli from the propeller wash that airplanes provide. Nitro RC heli engines in contrast, are rather hidden inside the helicopter, away from airflow and require a cooling fan on the crankshaft to pass some air over the head. These fans don't provide as much air flow however as a big propeller on an airplane, and therefor the cooling surface area of the engine has to be increased - thus the larger cooling surface area. Nitro RC cars and trucks often have similar cooling issues and use very large cooling heads. Nitro boat engines generally have liquid cooled heads with no cooling fins at all. The cooling fan location inside a nitro helicopter can be seen in the photo below. There is normally a cooling shroud covering the fan to direct air over the cooling head, but I've removed it so you can see the fan location. 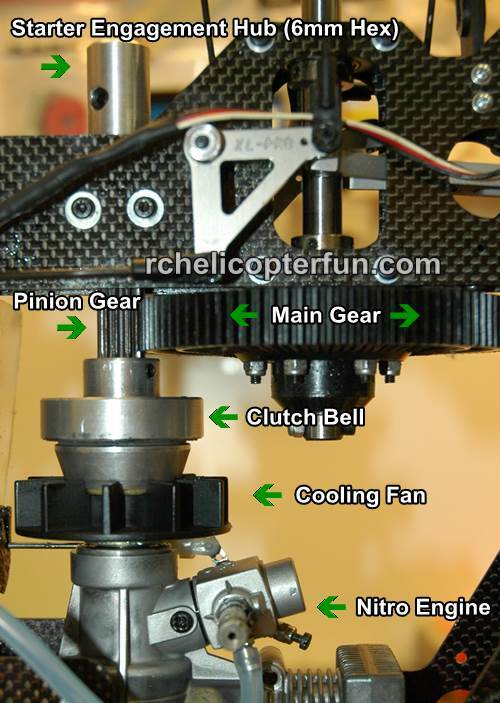 Nitro RC Helicopter Engine & Cooling Fan Location. The first thing we should understand is that the nitro engine in a heli, has different operating requirements than nitro engines in RC planes, cars & boats. Generally with these other disciplines of RC, the engine is set fairly lean to get the most power out of the engine without overheating it of course. This is usually not the case with RC helicopters. You basically want to set your engine in your RC nitro helicopter to run a little rich (more fuel than is required). You will notice this if you have ever seen a nitro helicopter fly, or have seen pictures or videos of RC helis. They produce a lot of blue/white smoke – this is because they are all running slightly rich and sometimes use higher oil to fuel mix ratios. To keep the engine running cooler so it won’t overheat and quit. To make sure the engine is always getting ample fuel so it won’t quit. You will notice the end result of both these points is to ensure the engine stays running. Keeping an engine running in an RC helicopter is obviously more important than milking ever ounce of power out of it. A flame out while you are 100 feet in the air when you haven’t learned how to do an auto rotation is not a good thing. The next operational difference between RC helicopters and planes, cars, boats, is at what throttle setting nitro RC helicopters run at. Throughout a flight, helicopters are generally running mostly in the mid to mid high throttle range. This places different requirements on the carburetor and is why all good nitro helicopter engines come also be paired with heli specific carburetors. They are designed to give the most reliable performance in the mid throttle band and ensure the engine is neither over fueled or under fueled while going through different transitional phases of flight. As you can appreciate from the above points, nitro RC helicopters rarely get 100% power out of the nitro engine because we want to keep that little engine running at all costs, especially when you are learning. As you move up to higher performance flying, you will probably lean out the mixture setting a bit more to keep your rotor rpm high, but nitro helis are always run on the rich side. Which brings us to the next point of engine sizing in our nitro RC helicopter? If we are purposely under powering the engine to ensure is stays running, we must get that power back by putting in a slightly larger engine than what is called for. Fortunately most nitro engine manufactures have recognized this and supply sized up engines. The RC helicopter manufacturers also recognize this and will specify what size engine to use. For example if you have a 40 sized helicopter kit, you will put in a popular sized heli nitro engine like a 46 or 50. Same goes for 30, 50, 60, and 90 sizes. Nitro engines are always sized a bit larger. This will assure you always have plenty of power reserves. Now let's figure out how we start these little power plants.